Durgin and Crowell is one of New England’s largest manufacturers of Eastern White Pine lumber. Since our founding in 1976, we have strived to improve our products and our process, adding value and improving efficiency. We try to get the most out of each log, and through innovation and years of hard work, the business has continued to grow. 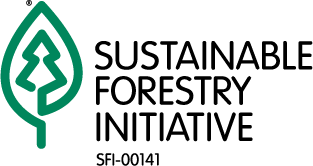 Sustainable Forestry Initiative (SFI®) certification adds value to our products, but we also believe in the merits of the program. Its good for our company, our industry, and our long-term wood fiber supply. As a company, Durgin and Crowell recognizes the importance of being able to change with the times, while not forgetting the past and the principles on which the company has succeeded. In order to stay successful for years to come, we need a sustainable wood supply. We source our wood primarily from New Hampshire and Vermont, and the majority comes from within a 50-mile radius. Most of our logs come from small, privately-owned woodlots. If those woodlots are well-managed, we should be able to purchase Eastern White Pine from the same land for generations. We believe there is ample fiber for the wood products industry in New England, if the resource is managed responsibly and sustainably. One of the foundations of the SFI® fiber sourcing program is the education of landowners regarding the benefits of sustainable forestry. Not only can a well-managed woodlot provide generations of merchantable timber for its owner(s), but it can also serve as important wildlife habitat and add benefit to water and air quality. If done properly, with adequate implementation of Best Management Practices , a logging job should cause minimal impact on the health of the local ecosystem. BMPs have been developed primarily to prevent soil erosion, impacts on important ecosystems like wetlands, and to prevent contamination and sedimentaion of surface water. BMPs are voluntary, and standards were developed by a committee with participation from industry, environmental and enforcement interests.Durgin and Crowell foresters conduct regular BMP inspections of our suppliers’ logging sites. We use the inspections to evaluate the overall use of BMPs by our suppliers, and to identify areas for improvement. Also, it provides an opportunity to stay connected with our suppliers, and to offer suggestions and accept feedback regarding our program. We require each log supplier to sign a Procurement Agreement, which addresses both BMPs and illegal logging. The State of New Hampshire has various forestry-related laws, which are enforced by state forest wardens. We support the efforts of enforcement officials and industry and conservation groups to raise the standard and increase the use of BMPs. Hopefully, with continued good work by log suppliers, and greater education of the public to the benefits of our industry, our industry will be able to help utilize and manage our region’s renewable fiber resource. Our goal is to have as much volume come from trained loggers as possible. We host PLP classes at our mill, and sponsor suppliers to attend classes throughout the year. Logger training is important to Durgin and Crowell, and we want it to be important to our log suppliers. As we go forward, more and more of our log volume comes from trained loggers. PLP and similar training programs help to improve the quality of work out in the woods. Training programs also keep loggers informed regarding law changes, professional skills and events, and fostering good working relationships between landowners, foresters, loggers and log buyers. We encourage landowners to use the services of PLP-trained loggers and licensed foresters, a current list of such qualified professionals in NH can be found here Qualified Professionals , or by calling our offices. Landowner outreach and education is a critical component of the SFI® fiber sourcing program. The majority of timberland in NH and Vermont is not certified under a third-party program. However, if landowners learn the long-term value of managing their land sustainably, with a written management plan developed with the assistance of a consulting forester, we hope that more landowners will decide to enroll in a certification program.